Looking for work?Looking to hire? Whether you’re in between jobs, have just moved into the area, or are home from school for the summer, NW Staffing Resources has you covered. Our short-term and seasonal opportunities are perfect if you’re looking to work for a few days, a week, or even a couple of months. We find long-term employment solutions for job seekers and employers, which allows both the company and candidate to evaluate placement compatibility prior to hire—it’s just that simple. NW Staffing Resources offers a variety of direct-hire and temp-to-hire positions in a wide range of industries. Our experience and rigid screening provides companies with hiring confidence while helping qualified, motivated individuals find rewarding jobs. Did you find an employee on your own? Great! Now let NW Staffing Resources tackle everything else—from screening, testing, background checks, skills assessments, and more. We can also help lighten your payroll burdens by providing traditional payroll services to managed solutions with á la carte, value-added options. We’ll work with you to develop a customized payroll outsourcing plan that will help you realize your business goals. Are you hosting an event in town or have a special project? We can provide experienced, enthusiastic, and reliable workers who understand exactly what it takes to support the ideal project experience. We hand select a team for each event from a pool of screened associates with a wide range of skills—from greeters and bag-stuffers to registration and fulfillment—to ensure your plan goes off without a hitch. We’ve been around the block: NW Staffing Resources is a privately owned and operated temporary, temp-to-hire and direct hire staffing services organization founded in May of 1985. Our original vision of being the Northwest’s leading provider of staffing services remains the same today as we near the end of our third decade. Since 1985, we have grown from a local business in Portland, Oregon to a regional West Coast company with multiple offices in Oregon, Washington, and California. 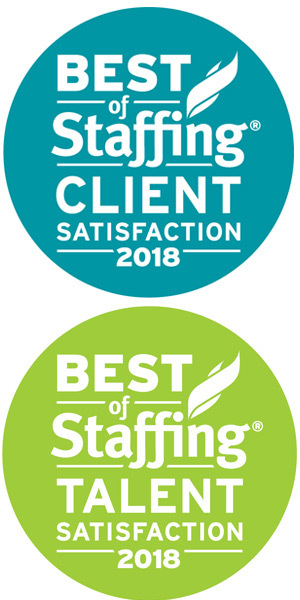 NW Staffing won Inavero’s Best of Staffing® Client and Talent Awards for providing superior service to their clients and job seekers. Inavero’s Best of Staffing winners have proven to be industry leaders in service quality based entirely on ratings by their clients and the employees they’ve helped find jobs. On average, clients of winning agencies are over two times more likely to be completely satisfied, and job seekers who work with winning agencies are nearly two times more likely to be completely satisfied with the services provided compared to those working with non-winning agencies. Less than 2% of all staffing agencies in the U.S. and Canada have earned the Best of Staffing Award for service excellence. Best of Staffing winners truly stand out for exceeding expectations and this award identifies the staffing industry’s elite leaders in service quality. Without the support of our fantastic clients and employees this would not be possible. For that we are truly grateful to you for allowing us the opportunity to serve you and serve you well! NW Staffing is a leading provider of temporary, temp-to-hire, and direct hire staffing services. Please check out our profile page at Inavero’s Best of Staffing to learn more.